World Laparoscopy Hospital is a unit of Delhi Laparoscopy Hospital Private Limited duly registered by government of India. The Website www.laparoscopyhospital.com is funded by World Laparoscopy Hospital, Gurugram, NCR Delhi. We do not take any donation and we do not earn money by advertisement on this website. Even thousands of video present on this website for our member surgeons and gynaecologist in password protected area is free of cost. Our member surgeons and gynecologist are benefited by updating their knowledge and skill though our website and serving the humanity in every corner of the globe. 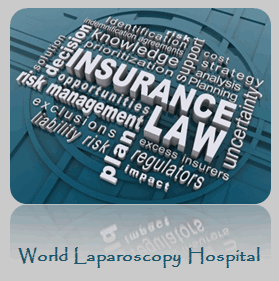 Professional liability insurance (PLI) for doctor is essential nowadays for laparoscopic surgeons. It is also referred to as professional indemnity insurance (PII) but more commonly called errors & omissions (E&O). It is often a type of insurance that can help protect doctors and corporations from bearing the full cost of defending against a negligence claim created by patient, and damages awarded in that civil lawsuit against Doctor. All the laparoscopic surgeons, gynecologists and staffs of hospital are covered by PLI. “Risk Management Company For Doctors” of WLH are covere by AICL and we feel privileged working with AICL (Apex Insurance Consultant Limited) which is formed under Indian Companies Act 1956 as a public Limited company with its main objective to provide expert legal services exclusively to the Doctors. The Company at present is having understanding with India ’s premier Insurance Companies including “ United India Insurance Company Limited” (A Government of India under taking). Each year details of budgets and accounts are published in our Annual Plan in May/June, and in our Annual Report and Accounts published in July/August. The Director of Finance and Information has corporate responsibility for overseeing the World Laparoscopy Hospital finances. The Board of Directors receives regular reports on our financial position and position regarding performance against activity targets. Finance reports are published in Board papers. These documents are available in hard copy from the Publication Scheme Coordinator. Please note: We make available as much information as possible about the sources of and state of our finances. In certain circumstances information intended for future publication, audit material, personal information, commercial or confidential information and criminal and regulatory investigative material or law enforcement material will be exempt from publication. We follow the procurement guidance established by the Government of Delhi, which sets out standard terms and conditions to be followed by MCI in the purchase of equipment and supplies. We welcome any comments, questions, or complaints you have about this editorial and advertising policy or our websites. Please feel free to contact us by sending an email to contact@laparoscopyhospital.com Revision date: This policy was last updated on July 12, 2007. You can browse the online knowledge base for the most common FAQs about our Training and Treatment. Visit Online Support. If you want to know how to reach us please click here: How to Reach Us. You can contact World Laparoscopy Hospital patient service any time, day or night. Whether you would like to send us a secure e-mail, contact us by phone or send a letter to a physical Gurugram address, you will also find the information you need at laparoscopyhospital.com We do not use shared server and we have our own DNS so we can secure the information shared with our patient and students. This achievement is a long story and hard work of more than a decade. Our software automates your request handling and problem resolution to yield quicker results of answering for patient's query and increase learning of our training surgeon by getting answer of their question as soon as possible. We have 24 hour chatting help line through our IT department you will just love to check it!. Whether you’re looking for more information, or you’d like to let us know how we did, you’ll find easy ways to contact us right here Contact Us. We may already have what you’re looking for, right here on our site. We suggest you start by checking in our FAQ (Frequently Asked Questions). Begin your search below to find a quick and easy answer.